Call for rural youth Agribusiness Entrepreneurs support. The proposal can be on an existing businesses/start-ups run by youth with a view of creating employment. The business proposal should be on innovative ideas across all sectors of agriculture – crops, livestock, agroforestry, apiary, ICT4Ag etc. This call is open to youthful farmers in groups/individuals aged 35 years and below in Kenya, Rwanda and Uganda. If the applicants are youth groups, the group should have at least 70% youth members. This call has been extended up to 20th June 2018. 3 years with the first round of support expected to culminate in possible business pitching to potential investors. 1st pitching in 2018, 2nd pitching 2019 and 3rd pitching in 2020. The next two rounds of support will focus on scaling up capacity building with practical trainings and linkages to potential funding support. 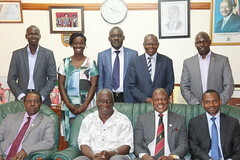 We shall also form a national and a regional knowledge sharing platforms through which information, support and opportunities will be shared.The support will seek partnerships with re-known business schools, business incubators, experts and mentors who will assist in developing a tailor made approach to capacity building.